Various electricity sources to provide electricity needs in Golden Gate Bridge being analyzed to gain the impact of each source to the global warming. In purposed to obtain environmentally-friendly energy source, problem in criteria of pollution resulted, sustainability, impact to the human health, and impact to the environmental still happened in two of three energy sources. Hazardous wastes are produced by the Nuclear reactor which is harmful to the human health, air pollution also occurs in the process of producing energy in Nature gas and highly responsible to the climate change. Either Nuclear reactor or Nature gas cannot provide sustainable energy source because the fuel is formed from non-renewable materials. Both of them revealed the possibilities of disadvantages are more dominant than the expected benefits. The last energy source observed (solar panel) shows different results which are sufficient to the criteria. Moreover, it can be placed in almost every part of the bridge as long as provide sun light, which means not necessary to change the design of the bridge. This observation suggested using Solar panel as electricity boost to Golden gate bridge electricity needs. World still needs green innovation in every aspect of life. Lately, human are threatened by their own fault because they ignore environmental existence in daily activities. Simple examples are use of paper inefficiently, careless disposal of plastic bag, and massive devastation action such as chopping a large number of trees just to make space for more buildings. Activists and groups which concerned about the environment from different parts of the world demanding that the country’s government need to pay more attention to the preservation and sustainability of forest. As a result, the government provides a solution to the problem of reduction of forest areas. In Indonesia the government controls programs to reduce depreciation of forest areas. They sought to revoke Decree forestry minister No.05.1/Kpts-II/2000 which is considered to provide convenience for the practice of giving ​​100 ha area for community groups or entities. Publishing PP. 34 of 2002 on Forest and Forest Management Planning governing forest management authority between central and local. The last is logging moratorium to stop illegal logging. All these positive steps indicate good long-term effects for continuity of human life with gradual improvement of forest conditions. However, it needs participation from other parties to support the current advancement. Solutions in the use of environmentally friendly energy sources (solar panels) for the electricity needs of bridges are one of way. Generally, almost everyone knows that the bridge needs energy, especially to operate the lighting system. An example is the Golden gate bridge (Figure 3 and 4) in San Francisco bay which spends 4.5 Megawatts of energy to power 25,000 LPS. Saving energy needs actually can be done by using solar panels as an alternative energy source. Fortunately, Sandro and his team from Massachusetts Institute of Technology (MIT) found a solution for major problem of solar panel (The efficiency) by developed latest solar panel technology by combining common solar panel and Infrared receiver to work together makes the device provide higher efficiency. The usage of this device as a supporter of green energy methods gives positive impact as alternative energy solutions that are environmentally friendly. This observation is started with reading several articles in the internet about related topic. Those articles are observed to get the positive or negative impact in application either it is already happened or still in planning phase. After done with the observation and get the data as the result, it is filtered into several groups depends on the specification. Material, benefits and disadvantages on each group are collected in order to be criteria of good energy boost of efficiency and environmental impact. Result of this observation is provided in several pictures (Figure 1, 2 and Table 1) and a sketch (Figure 7) and the explanation are written. 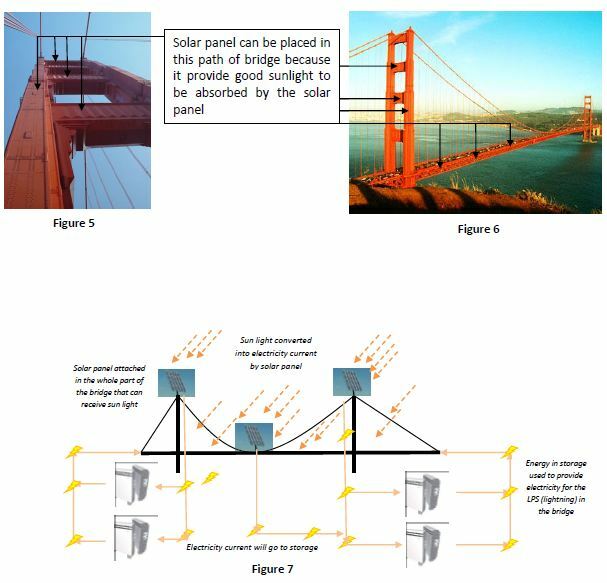 Picture is to show how solar panel can be placed in a bridge (Golden Gate Bridge in Figure 5 and figure 6) and what the effect of this method. Sketch will show the shape of the bridge when solar panel is already attached on it. All of the impact of solar panel will explain by written explanation. 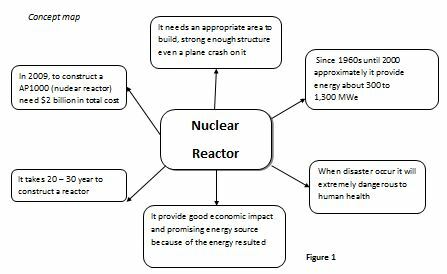 Nuclear reactors provide a very large number of energy and lead to a good economic condition. These phenomena not built in just one night, but its take time for 20 to 30 years in construction. Other problem like choosing an appropriate place, manage the waste, select the material of the reactor, calculating for possibility disaster that might happen and about people safety will occurs and must be solved before deal to construct it. Natural gas burns more cleanly than other hydrocarbon fuels, such as oil and coal, and produces less carbon dioxide per unit of energy released, also have sufficient price for people. But it still non-renewable energy and create waste which is harmful to the environment. To gain the natural gas, miners are risky to get injured if an accident happens there. 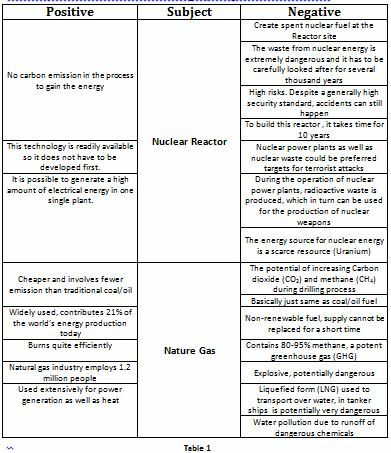 Each nuclear reactor and natural gas has own advantages and disadvantages in the application, but still both of them is produce harmful waste to the environment and human itself. Meanwhile, the condition of earth is getting worst constantly. People cannot avoid the electricity needs, they are force to use electricity source which is non-environmentally friendly. Take an example of Golden Gate Bridge. Its need large amount of electricity each day, and it means more waste will polluted the environment caused by non-environmentally friendly electricity source usages. If kind of energy source likes this keep going, earth will be totally black as an impact of hazardous waste. It is will not happened if Golden Gate Bridge uses solar panel as the electricity source. Nuclear reactor able to provide large amount of energy only from one reactor, but it is harmful to the environment because of its hazardous waste and an extreme potential risk if disaster occur. Nature gas (Shale gas) produce less pollution compared to other fossil fuel, but it used non-renewable for the fuel furthermore it is still contribute pollutant that makes global warming increase.